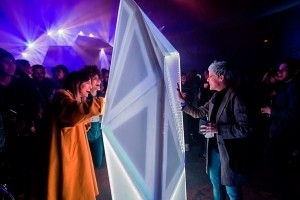 The Barcelona-based start-up ProtoPixel has designed the lighting technology for the first intelligent stage at this year’s Primavera Sound, scheduled to take place from June 1 to 3. The stage includes over 260 metres of LED lighting that transforms automatically in real time according to the beat, the time of day and the size of the audience to create a unique viewing experience. The project was carried out in collaboration with ACCIÓ, the local governmental body in charge of promoting competitiveness in companies through innovation and internationalisation. Each year, Master in Management participants have the opportunity to work as consultants in real companies through the MAP (Market Assessment Program), which connects tech start-ups with EADA students. The team that created the business plan was made up of Elif Baloglu (Switzerland), Tatiana Boltiansky (Argentina), Marco Borgoglio (Italy), Mostafa El-Menshawy (Egypt) and Christoph Stamm (Germany). In addition to the proposed business model, the comprehensive plan included initial investment recommendations as well as an analysis of the global lighting market and the industry lifecycle. Team members recognised early on that ProtoPixel’s product would “disrupt the lighting design industry”.